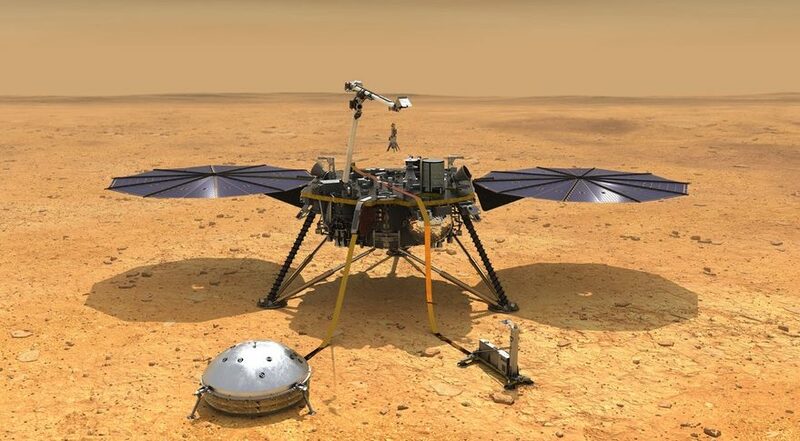 THE WOODLANDS, Texas — Engineers are still trying to understand why one of the main instruments on NASA’s InSight Mars lander is stuck just below the Martian surface. In presentations at the 50th Lunar and Planetary Science Conference here March 18, project officials said they plan to spend the next few weeks determining why the probe on the Heat and Physical Properties Package (HP3) instrument, designed to measure the heat flow in the interior of the planet, is stuck about 30 centimeters below the surface, well short of its desired depth of three to five meters. The probe, known as a “mole”, started to burrow into the surface Feb. 28, hammering its way into the surface. Tilman Spohn of the German space agency DLR, principal investigator for HP3, said that it appeared to reach a depth of about 30 centimeters after a four-hour hammering session. The probe, though, went no deeper during a second, five-hour hammering session March 2, after which the instrument team decided to hold off on further efforts to burrow into the surface. The instrument team is working to diagnose the problem, he said, including seeing if the problem is with the instrument itself or the material it is trying to penetrate. One possibility is to use the lander’s robotic arm to pick up the support structure on the surface to see if the mole is sticking out, but Spohn said any such plan would need to be “carefully considered” first. The other main instrument on InSight, a seismometer called the Seismic Experiment for Interior Structure, is working well. The instrument is now in place on the Martian surface and covered with a wind and thermal shield. Banerdt noted that the instrument’s noise level is about a factor of 100 below the best seismometers on Earth. The only problem with the seismometer is that it has yet to detect a Marsquake, a lack of activity he said is not surprising. “This is exactly where we expected to be,” he said. The instrument has been fully operational for about a month, he said, and before the mission he expected to detect 10 to 12 quakes per Earth year.